Christ emphasizes that everyone who refuses to repent (the barren fig tree symbolizes someone who lacks the fruits of repentance) will stay separated from God. 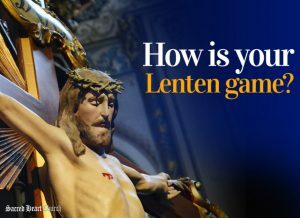 “If you do not repent, you will all perish.” This is an uncomfortable truth, but one that the Church wants us to consider deeply, especially during the penitential season of Lent. We need to repent from our sins in order to bear fruits of communion with God. How’s your Lenten Game plan going? Getting stuck in a rut because you took on more than you can deliver on? Ok, how about keeping it simple and concrete. Live Lent through your spouse, sibling, or close friend. What irks them that I can choose to change my behaviour or attitude in the moment this bad habit surfaces? Daily dying to self, is the best fertilizer for good fruit to be born of God in this season of conversion.